This monkfish recipe is my all time favorite. I first tasted monkfish in Portugal in 1981 and when I got home, I developed this tomato and white wine sauce to go with it - a huge success with all my friends and family. This is one ugly fish, I must say - you don't get to see the head very often thank goodness, just the tail - the meat of which is divine. Before you cook monkfish, you must take all the skin/membrane off - if you don't it toughens as it cooks - you'll need a sharp knife to do this, just pull and peel until it's gone. 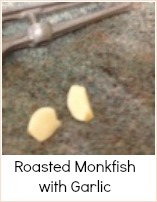 Also, it's important to fry off the monkfish chunks quickly in oil - if you don't it will shred in the sauce and will be more reminiscent of white crab meat. You just need to seal it like you would chunks of beef or other meats. Heat 1 tbspn oil in a pan and soften the garlic and onion. Add the tomatoes, tomato puree, wine and basil and simmer until thickened. In another pan, heat 1 tbspn olive oil and quickly fry off the monkfish. The idea is to seal it, not cook it through. 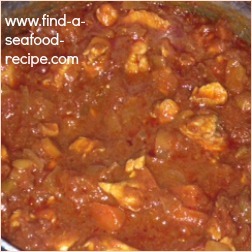 Add the monkfish and oil to the tomato sauce and simmer gently for about 5 minutes - until the monkfish is cooked. Add the prawns and olives and heat through. Serve with boiled new potatoes or saute potatoes, green beans, broccoli and cauliflower. Provide some fresh crusty bread to mop up the sauce. Gorgeous meaty monkfish cooked in a tomato and wine sauce.